KIEV, Ukraine -- It was better, at least, than fighting in a war. 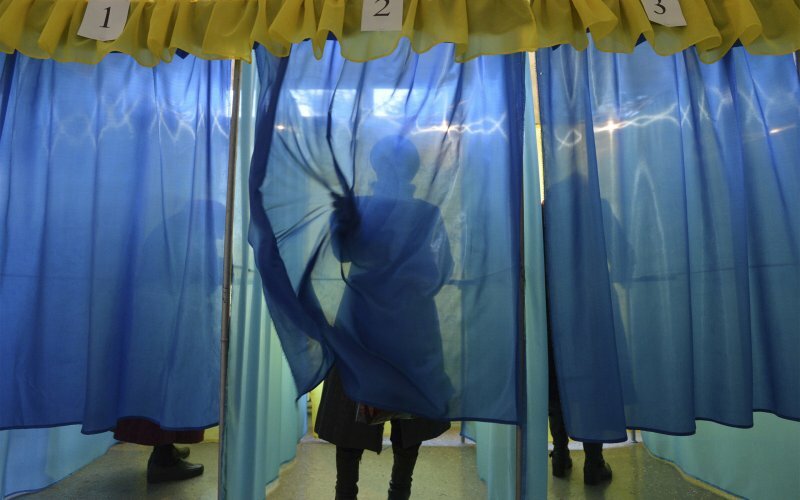 The balloting in Ukraine’s local elections on Sunday was messy and sometimes violent. Candidates and voters lost their tempers, smashed each other’s faces, fractured digits and twisted arms at polling sites in Melitopol, Kharkiv and Odessa as tensions lingered in badly bloodied eastern Ukraine. Most of the towns of the Donbass region, with its population of over 3 million people, were not able to vote because the territory remains in the hands of pro-Russian militants. Overall, more than five million Ukrainian citizens out of 45 million were unable to vote because of the lingering effects of the two-year conflict. But the momentum has gone out of the rebellion, a ceasefire has been holding, and Moscow has turned its attention elsewhere. Russian independent experts believe that, after his popular seizure and annexation of Crimea, President Vladimir Putin did not have a well developed plan for Donbass other than to turn it into one more shadowy separatist territory, similar to Transnistria in Moldova or Abkhazia in Georgia. So the Kremlin never announced the end of the conflict in the Luhansk and Donetsk regions of Ukraine. Rather, one day last month Russian mainstream media simply stopped talking about the war in Donbass, entirely, and began to cover the Syria war instead. But that’s not all good news for Kiev. What the local elections showed is that even outside of Donbass the Ukrainian electorate remains torn between the pro-Russian east and the pro-Poroshenko center. According to preliminary vote counts, Poroshenko’s Solidarity bloc was leading with 24.15 percent, the nationalist Svoboda party came second with 12.74 percent, and former Prime Minister (and political prisoner) Yulia Tymoshenko’s Batkivschyna garnered 11.46 percent. As the voting proceeded, some brawls broke out. An ambulance took one candidate, Roman Dundnik, to a hospital with a bruised chest and broken finger. His impromptu sparring partner, another candidate named Anatoliy Demyanenko, ended up at a police station. A political struggle with the richest man in Ukraine, Renat Akhmetov, boiled over in the city of Mariupol, on the line of control with rebel-controlled territories. There, the election process failed completely. Not one of the city’s more than 200 polling sites was able to open on Sunday morning, as more than 600,000 ballots remained in sealed boxes. The ballots became the final issue, officially, but to local pro-Ukrainian activists the cancellation of the election was a victory in a big local war against the billionaire Akhmetov. The post-revolutionary generation of candidates were upset the ballots for the elections were printed in a shop that belonged to Akhmetov, a figure also tied to one of the political parties of the pro-Russian Opposition Bloc. “That makes our society doubt the legitimacy of these elections,” the head of the Mariupol regional administration said on Sunday. Activists of several pro-Kiev political parties demanded to postpone the election. “The Opposition Bloc made an attempt to take the election under their control, but we did not allow that to happen,” a local activist and politician, Galina Odnorog, told The Daily Beast. Two more towns, Krasnoarmeysk and Svatovo, had to cancel the balloting. As a result, the pro-Russian opposition felt angry and frustrated. On Monday, the Kiev-based political scientist Mikhail Pohrebinskiy concluded that at the moment Ukraine is not able to organize legitimate elections in the eastern regions, even apart from Donbass. “Authorities blocked elections in Mariupol, as they realized that pro-Kiev parties could not win in the region,” Pohrebinsky said. “In spite of all the hard and sometimes violent moments we still have much more transparency now,” said Mustafa Nayem, an influential member of parliament. By 6 p.m., many regions had more than 30 percent turnout. Ukrainians were voting for 10,700 local councils and city mayors in elections. One of the heroines of the hustings, this time around, was former prime minister Yulia Tymoshenko. Her party, Batkivshchyna, was doing better this year than many of her rivals. Not many Kiev politicians expected Tymoshenko’s return to politics. But in the midst of the war, economic crises and internal fights between powerful clans and revolutionary political figures, many Ukrainians have started to see Tymoshenko as a high-profile figure, needed at this confusing times. Batkivshchyna’s popularity grew during this election campaign, falling only one percent behind President Petro Poroshenko’s party. She promised not to allow anybody to throw Ukraine back to the past, when one oligarch decided the fate of elections, but to be an independent self-sufficient country. Maybe in Ukraine, at a time when men still use their fists to settle political disputes, a woman’s presence is a welcome touch.